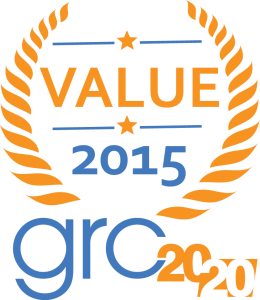 GRC 20/20 is accepting nominations for the 2015 GRC Value Awards! Effective: At the end of the day it is about effectiveness. How does the organization ensure risk and compliance is effectively understood, monitored, and managed at all levels of the organization? Efficient: GRC engagement provides efficiency and savings in both human and financial capital. GRC efficiency is achieved when there is a measurable reduction in human and financial capital resources needed to address GRC in the context of business operations. Agile: GRC engagement delivers business agility where organizations can respond rapidly to changes in the business environment (e.g., employees, business relationships, mergers and acquisitions, new laws and regulations) and communicate to employees GRC context to these changes. Please submit nominations before midnight on October 5 2015. Nomination forms will be accepted until this date, finalists selected and deeper dives in mid-October, with recipients selected by end of October and announced in the beginning of December. Award recipients will be announced to vendors end of October so that coordinated announcements/press releases can go out in the beginning of December. NOTE: You must be logged in (with a free account or GRC Advisor account) to see the 2015 GRC Value Nomination Form below. There is a save and continue button at bottom of form.